How to have a strong brain in your 40's, 50's, 60's, 70's, 80's, and beyond! A new study has shown Candida, a common fungal infection, can cross the blood-brain barrier and eventually cause Alzheimer’s or dementia. In our free AGE-PROOF YOUR BRAIN video we share the best information on how to make sure your body doesn’t outlive your brain. In all cases of Alzheimer’s or dementia, there’s brain inflammation (neuroinflammation). But, inflammation doesn’t just ‘magically’ appear. Something has to cause the inflammation. 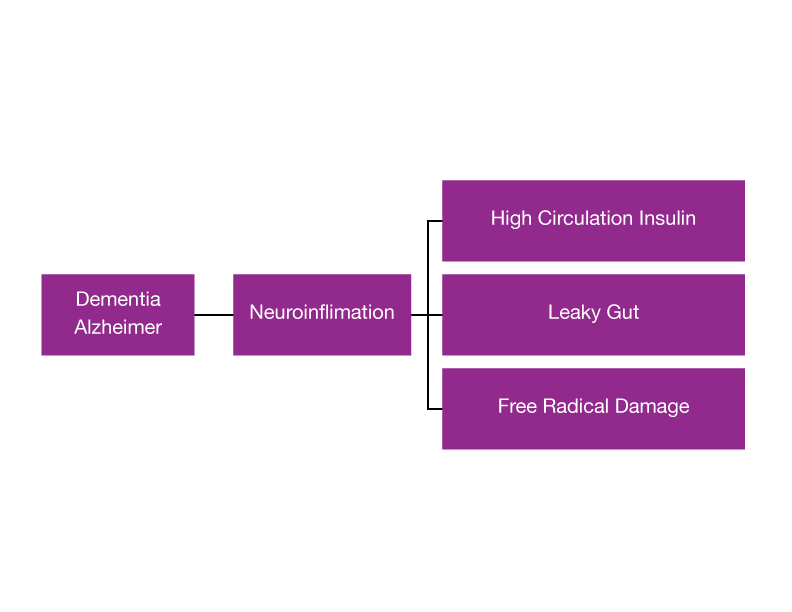 As you can see from the graphic, the three big causes of brain inflammation are HIGH CIRCULATING INSULIN, LEAKY GUT SYNDROME, and FREE RADICAL DAMAGE. Any of these can lead to dementia and Alzheimer’s. This new study has shown once again Leaky Gut Syndrome can be directly linked to brain disorders. In order for candida to get into your brain, two things have to happen. Candida, like other bacteria and viruses, should be KILLED by the acid in your stomach. The problem is, most people after the age of 40 have low stomach acid. The biggest indicator is heartburn. Heartburn isn’t a problem of too much acid. It’s actually caused by having not enough! Other symptoms of low stomach acid are bloating or burping after meals, the feeling that food is sitting in your stomach after eating, hair loss (women), yeast infections, athlete’s foot, jock itch, or toe nail fungus. The only way candida can get into your blood is if it passes through your stomach, into your intestines and then into your blood. Leaky gut syndrome is the biggest cause of candida infections. You can learn more about the dangers of Leaky Gut Syndrome here. What can you do to protect yourself from candida? Make sure you’re taking a good digestive enzyme and probiotics.